NAIROBI, Kenya The Kenyan government said Monday that it had likely recovered the remains of four gunmen who stormed the Westgate shopping mall on Sept. 21 and killed more than 60 people. The discovery came exactly a month after the brazen attack, as families and friends of those killed gathered to plant trees in memory of lost loved ones, and allegations that security forces looted the mall in the chaos after the attack cast another level of sadness over the memorial. Joseph Ole Lenku, Cabinet secretary for interior, said that on Sunday "we recovered a fourth body, which we know from CCTV footage to be that of a terrorist." He said in his message late Sunday that officials believe the remains of three people recovered at the mall last week are also "those of the terror suspects." Closed-circuit TV footage from Westgate Mall shows four gunmen taking part in the attack. Lenku said "DNA and other investigations will confirm their identities." So far, one gunmen has been identified: Hassan Abdi Dhuhulow, a Somali-Norwegian. The memorial service stressed that the attack occurred against people of all races and religions in the Kenyan capital. 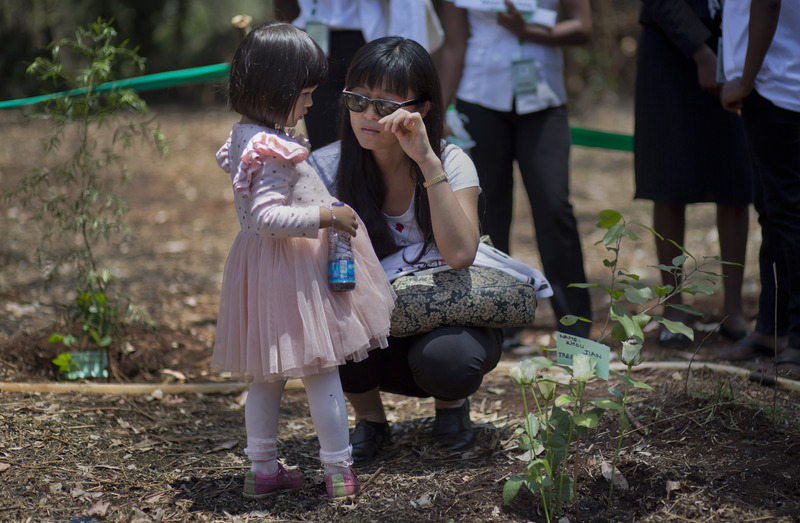 Karanja Njoroge, chairman of the friends of Karaura Forest, said the families didn't come together to mourn as much as to remind everyone that Kenya is a country of Christian, Muslim and Hindu residents. Vaishal Shaha, who lost a friend in the attack, said it was hard for Nairobi's different communities to come together in the wake of the looting allegations. CCTV video is also behind the allegations against Kenyan soldiers, who are seen walking out of a store in the mall, holding plastic bags heavy with unknown items after the attack. Others looked behind counters and lifted items. In security camera video seen by The Associated Press on Sunday, some members of Kenya's armed forces appeared to loot a store during the four-day siege of Nairobi's most upscale mall. At least 67 people were killed in the attack by Islamic extremists. Kenya's security forces have previously denied any wrongdoing. Soon after the attack began on Sept. 21, Kenyan officials put a security cordon around the mall, allowing only security forces and a few government personnel to pass through. When the attack was over, some who owned shops inside the mall complained of looting. Mobile phones were ripped from displays, cash registers emptied, and even alcohol stocks plundered, according to AP reporters at the scene after the siege ended. Public servants in Kenya, including police, firefighters and soldiers, are poorly paid and frequently accused of corruption. In the case of the Westgate attack, a team of Kenyan lawmakers that investigated the looting allegations cleared soldiers of any wrongdoing. The Somali Islamic extremist group al-Shabab claimed responsibly for the mall attack, saying it was in retribution for Kenya's military involvement in Somalia.